What if your corporate event could build a sense of community and collaboration among your team members and could be fun and delicious, too? 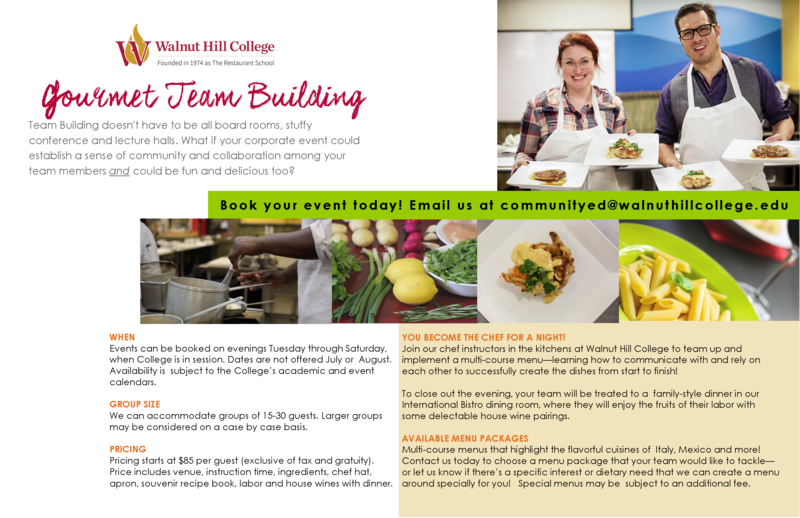 Walnut Hill College now offers corporate cooking events where YOU become the chef for the day! We will provide you will all the tool you need to prepare your menu choice. Our chef instructors will help you work together in the kitchen and walk you through cooking a multi-course menu. You will learn how to communicate with and rely on each other to create the dishes successfully from start to finish! Once your team is finished creating a magnificent meal in the kitchen, you will be seated in our International Bistro where you will enjoy the fruits of your labor in a family-style fashion.